Search For "Shopping & Stores" Companies in Edmonton, Alberta - Click Here Now! 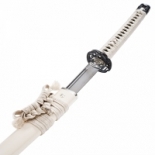 An Official Distributer Of Thaitsuki Swords For North America. Avoid Customs And Duties, Purchase From Canadian Samurai. Free Shipping And Customer Loyalty Discounts. Visit Our Website Today. Canadian Samurai in Edmonton is a company that specializes in Sporting And Recreational Goods And Supplies. Our records show it was established in Alberta.